What impels an artist to take visual imagery and create dimensions of form and substance? A sculpture, as many would know, manifests its impact through the aesthetic sensibility of tangible reality. It is something you see, feel, move and experience almost like another entity in your society. Sometimes I try to ponder on the different meanings and styles of mannerist sculptors, as well as their take on life as an artist. My meditations have led me to believe that sculpture is not a generic reproduction of style, as some may believe. On the contrary, this art form begs for originality through its ability to create depth in composition and intimacy. The intimacy I speak of is a raw emotional undertaking that connects people through the way of visual, tangible and sensual narration. I've always been fascinated by an artform so versatile as this, that the very limits of expression can be tested without leaving out any of the senses behind. 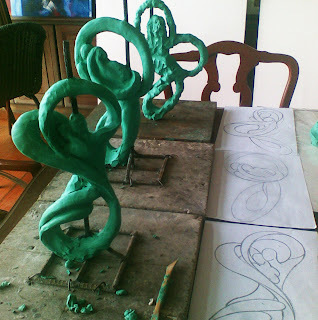 The reason I love sculpture and its integral meaning, is because it calls out to be experienced (not seen, experienced) in the scope that its presence fills the gap between storyteller and audience. For the most part of my career as an artist I've always tried to delve into the dimensional perspective of reality, to be able to see things completely through more than one point of view. To encompass the gravity of its presence as a subject and as an expression is essential. The value of sculpture lies in its ability to tell stories, and be a part of them in its lifetime. wish you could tell me more about aurora australis. Nice work kylo, I like aurora Australia! it reminds me of a spiral artwork I wanted dati from a gallery we visited in Europe. Aurora Australis is my very first numbered edition piece with variable bases. Eight pieces were made, with narra and mahogany irregularly contoured bases. 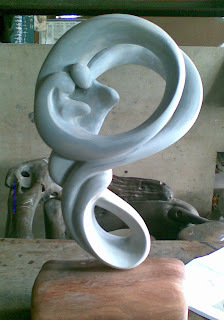 The figure eight, or upright infinity is my trademark mannerism in several of my pieces, It gives the impression of a continuity and purity in life's moments. Aurora Australis has been one of my most favored designs, especially before commencement, and that is why I decided to create 8 pieces instead of one. It's symbolical shape also thrives through several design interiors and can manifest the style through even the darkest and most textured tones.